The Centre for Educational Technology (CET) was established by Yad Hanadiv in 1971, in partnership with the State of Israel, to develop innovative and effective methods of teaching and learning using modern technologies and instructional materials. In 1977, far in advance of personal computers, CET introduced individualized computer-aided learning systems into the Israeli school system. By 2018 CET had published 1,400 printed and 1,000 digital titles, developed hundreds of websites and trained tens of thousands of teachers. Over the years, development projects supported by Yad Hanadiv have included: an online ‘virtual campus’ for teachers’ professional learning and interaction; distance tutoring; projects to advance literacy of native Arabic speakers, online digital books, MindCET Edtech Innovation Centre and an adaptive learning platform. The Instructional Television Centre, launched in 1966, was a ground-breaking effort to use television as a tool to enhance the school curriculum in Israel. Yad Hanadiv established the Instructional Television Trust, built its premises in Ramat Aviv and operated the project. Educational objectives were defined in cooperation with the Ministry of Education and Culture. The first broadcast, which included mathematics, biology and English classes, inaugurated television transmission in Israel, and 60 television sets were distributed to 32 schools around the country to enable them to receive the first broadcasts. In 1969 Yad Hanadiv handed over the entire project to the State. Upon his death in 1957, James de Rothschild bequeathed a sum of money for a Knesset building in Jerusalem, expressing the hope in a letter addressed to Prime Minister David Ben-Gurion that the new building would become ‘a symbol in the eyes of all men of the permanence of the State of Israel’. The widow of James, Dorothy de Rothschild, undertook to carry out the project. A decade later, on 30 August 1996, the new Knesset building was dedicated in a ceremony in Jerusalem. Dorothy de Rothschild, the widow of James, who endowed the construction of the Knesset, believed that a building for the Supreme Court would fully realize her husband's visionary emphasis on Israel's fundamental commitment to both Justice and Democracy. Yad Hanadiv's Trustees committed to fund a new home for the Supreme Court, including infrastructure and furnishings. The competition for the design was won by Israeli architects Ada Karmi-Melamede and Ram Karmi. At the time of the building's inauguration in 1992, the New York Times called it ‘Israel's finest public building’, achieving ‘a remarkable and exhilarating balance between the concerns of daily life and the symbolism of the ages’. 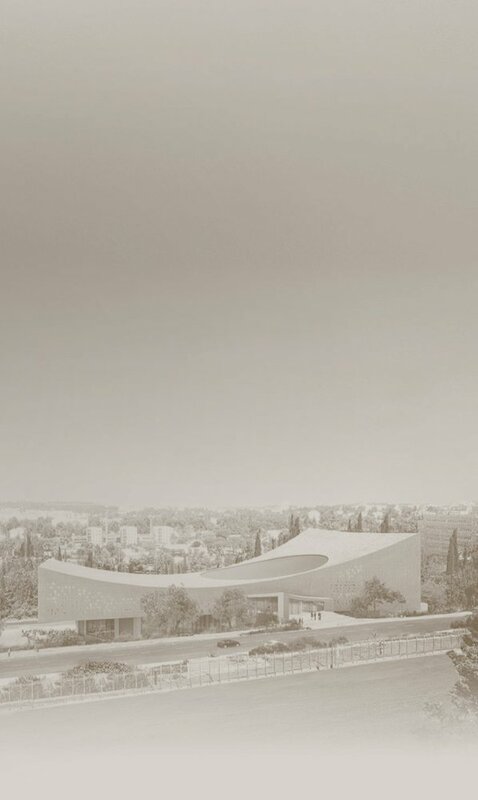 The Jerusalem Music Centre (JMC) was established in 1973 at the initiative of violinist Isaac Stern and Jerusalem Mayor Teddy Kollek, as a partnership between Yad Hanadiv and the Jerusalem Foundation. Over the years it has nurtured outstanding young musical talent and provided opportunities for Israeli musicians and music students to study with internationally renowned artists, such as Leonard Bernstein, Pablo Casals, Arthur Rubinstein and Murray Perahia, who has served as JMC President since 2009. The JMC provides Jerusalem with a vibrant cultural centre offering top-quality chamber music concerts, master classes and workshops. In 1971 Yad Hanadiv invited a commission of experts to Israel to examine the establishment of an ‘Everyman’s’ university based on international models. In August 1973, the government adopted the commission's recommendations and Yad Hanadiv undertook to set up and finance the University for its first five years. The OU opened its doors in 1976 and today has an enrolment of 46,000 students. Yad Hanadiv supported the construction of The Dorothy de Rothschild Campus in Ra'anana, inaugurated in 2004. Since then, the Foundation has helped to fund numerous OU initiatives, including the Centre for Information Technology in Distance Education (Shoham), the Peer Open Books project, translation of texts and course materials into Arabic and MindCET. GuideStar Israel is an online comprehensive database of information about Israeli non-profit organisations. Launched in August 2010, it includes information from the organisations as well as official filings required under Israeli law. It serves as an extensive source of data on the Third Sector and facilitates decision making on issues relating to Civil Society in Israel. Israel was the third country to establish a GuideStar database, after the US and UK. The project was a joint venture of the Ministry of Justice, JDC-Israel and Yad Hanadiv. As of 2017, GuideStar is fully funded and operated by the Ministry of Justice, with the cooperation and guidance of a public committee. The introduction of modern agricultural technology has led to the decline and loss of many cultivated, genetically heterogeneous plants indigenous to Israel. To combat this, the Israel Gene Bank was established to gather existing collections of genetic materials of traditional crops into a single, comprehensive seed bank. Yad Hanadiv funded the visit to Israel in 1995 of an international committee of experts, whose report in May 1996 recommended construction of a new bank and storage facility. The Plant Gene Bank, inaugurated on 1 January 2008, was built within the Agricultural Research Organisation of the Volcani Institute, and its ongoing operation is funded by the Ministry of Agriculture and the Ministry of Science. Yad Hanadiv began its support for Archaeology In the 1950s and 1960s with the James de Rothschild Archaeological Expedition to Hazor. It was followed by restoration work at Masada and Caesarea, in the Old City of Jerusalem, at Ramat Hanadiv, Hirbet Hamam and Huqoq among others. Throughout the years Yad Hanadiv has also promoted the publication and dissemination of excavation reports. In 2009 it set up the Yizhar Hirschfeld Memorial Fellowship in Archaeology to encourage younger Israeli archaeologists to innovate and pursue their scientific agendas. The last 50 years have witnessed a revolution in the way archaeology is practiced. In the late 1990s Yad Hanadiv began providing support to the Kimmel Centre for Archaeological Science at the Weizmann Institute. The Institute is devoted to training a new generation of archaeologists in methods that incorporate scientific techniques and to promoting inter-university collaboration. The Foundation has supported cooperative efforts among scientists and archaeologists to develop unique methods of examining archaeological finds using 3D scanning and digital processing. As early as 1966, less than one year after the opening of The Israel Museum, Yad Hanadiv donated a group of outstanding paintings by Cézanne, Van Gogh and Gauguin. It has continued to enhance the Museum’s collections through gifts such as Nicolas Poussin’s Destruction and Sack of the Temple of Jerusalem, acquired in 1998 in memory of Sir Isaiah Berlin. Yad Hanadiv also provided ongoing support for the Tamar and Teddy Kollek Chief Curatorship of Archaeology and in 2005 joined other funders in contributing to the capital renewal plan for the Museum. In 2008, Yad Hanadiv provided support towards the NanoMed programme at the Technion, led by Nobel Prize Laureate Professor Aharon Ciechanover. The programme aims to develop large-scale activity at the interface between Nanotechnology and Life Sciences by breaking down the boundaries separating scientists in Engineering, Life Sciences, Physics, Chemistry, Computer Science, and Medicine. It emphasizes biomedical imaging, novel disease biomarkers and targeted drug delivery. Support included a PhD programme, faculty positions and infrastructure investments. Investing in green building has been a natural outcome of the Foundation’s commitment to promoting environmental health and awareness. The Visitors Pavilion at Ramat Hanadiv, completed in 2008, was the first public building in Israel to be granted a Leadership in Energy and Environmental Design (LEED) Certification from the US Green Building Council for sustainable construction. Yad Hanadiv’s offices in Jerusalem, completed in 2013, received Silver LEED Certification. The new National Library building, designed by Herzog & de Meuron and scheduled to open in 2021, is being planned for highest-level compliance with environmental building standards and LEED Certification. The Jerusalem Seminar in Architecture was initiated in 1992 by Yad Hanadiv as an international conference series dedicated to discussing contemporary topics in Architecture, Urban Planning and Design. It was created as a platform to share and expand on the knowledge accumulated by the Foundation during the construction of the Supreme Court Building. The seven conferences held between 1992 and 2009 attracted some 1,200 professionals, researchers, students and the public, and provided a lively forum for dialogue and exchange of both theoretical and practical ideas. In addition to lectures, the seminar featured master classes and a design competition for Israeli architecture and design students. Yad Hanadiv assisted Rabbi Adin Steinsaltz to complete his Hebrew translation of the Babylonian Talmud with Commentaries and to place it online. The Foundation promoted the Friedberg Genizah Project in cooperation with the National Library of Israel and the Israel Antiquities Authority’s project to digitize the Dead Sea Scrolls. Support has also been given to advance the work of Sefaria – a non-profit organisation which is assembling a free online library of digital texts in Hebrew and in translation. The Water Research Institute was established in 1993 by the American Technion Society and Yad Hanadiv to address critical issues surrounding the supply and quality of Israel’s water and to advance the science, technology, engineering and management of water resources. The Institute operates from a broad national perspective, fostering interdisciplinary work and encouraging cooperation among diverse researchers in Israel, as well as promoting projects with neighbouring countries. HEMDA was established in January 1988 by Yad Hanadiv and the Tel Aviv Municipality as a regional centre for high school science education in Tel Aviv. The initiative followed up on conclusions of an expert Committee chaired by Professor Haim Harari. The centre offers advanced level physics and chemistry, drawing on teaching and laboratories at a higher standard than is available in schools. Most of its outstanding teaching staff hold PhDs in chemistry and physics. HEMDA attracts a broad range of students from diverse backgrounds and communities. MANOF is a residential youth village situated north of Acco. It was founded in 1975 at the initiative of Yad Hanadiv and in partnership with the Ministries of Education and Welfare, based on a recommendation of Professor Haim Adler. Since then, some 1,600 youth-at-risk have studied and lived at MANOF, gaining high school education and vocational training. Yearly enrolment is about 180. MANOF accepts students aged 15 to 17 who have been unable to integrate successfully into other educational frameworks. Their experience in the youth village restores their self-esteem, provides an opportunity of acquiring a profession and fosters their reintegration into society.